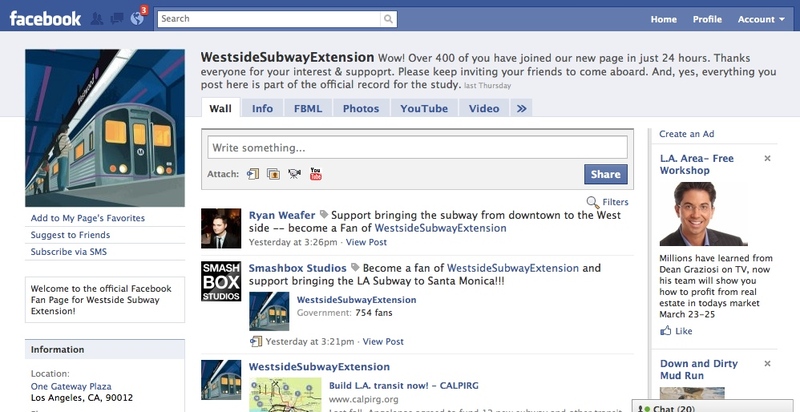 The Westside Subway Extension launched a new Facebook page last week — a good way for Facebookers to easily get information about the project mixed in with status updates from friends and others. Think of it this way: At the same time it’s possible to learn your best buddy just took out the garbage, it’s also possible to get short, digestible funding and planning updates from the subway project. The subway project has been a pioneer when it comes to social networking — its Facebook group has more than 2,300 members and was one of the first transit projects to use Facebook to get the word out. Many others have since followed, finding its easier to reach people through Facebook rather than expect people to frequently visit a static website that may be hard to locate. So why the new page? A couple of reasons. Facebook pages are better developed than they were a couple of years ago and the new page should also allow those interested in the subway to better interact. The Facebook group is still being maintained but subway officials would like fans to transition to the new page. More than 750 people have already done so. Several other Metro projects have Facebook projects. These include the Crenshaw Line, the Eastside Extension of the Gold Line phase 2, the 405 Sepulveda Pass widening project, the Downtown Regional Connector and the South Bay Green Line Extension. There is also a general Metro page.